Recently ,I worked on on a SCCM project and as initial step ,it was mandatory to bring all the desktops and servers (where ever it was missing) into SCCM with Client installed. 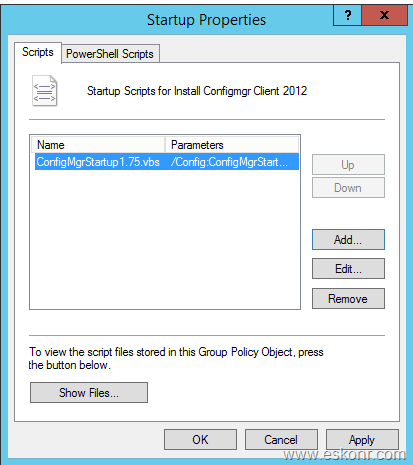 Though ,there are different client installation methods available to install SCCM Client , one of the most widely used client installation method is Client startup script deployed via group policy. Jason Sandys (MVP) created nice Client Startup Script (group policy) that install configmgr client agent during the system initial boot up. If you want to achieve good client success rate ,would strongly recommend to look into script and get it implemented . 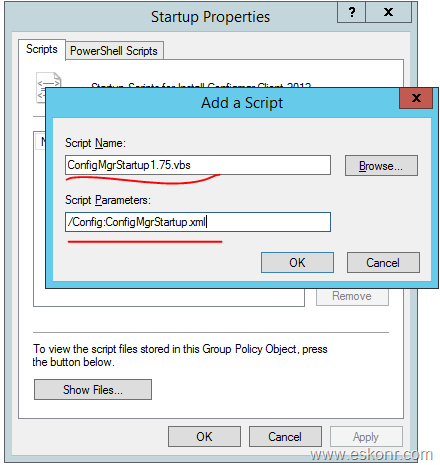 You can download the script from his blog post http://blog.configmgrftw.com/configmgr-client-startup-script/ .It has pdf document with all the instructions ,how to edit the xml file to make necessary changes. In this blog post, I will show you, how to implement Jason Sandys client start script in your environment starting from creation of SCCM client folder ,creation of group policy ,deploying the group policy and tracking the results incase of any failures. Hope this blog can help to start with. 2. 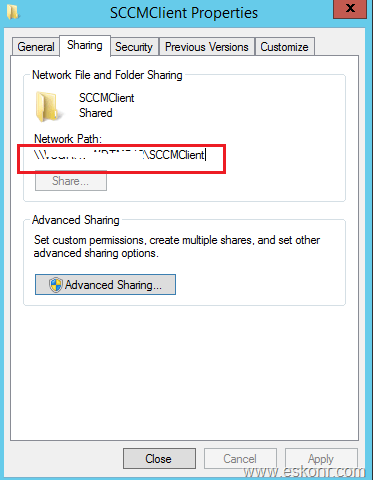 Copy the SCCM Client installation source files from your SCCM installed directory to above created folder (SCCMClient). 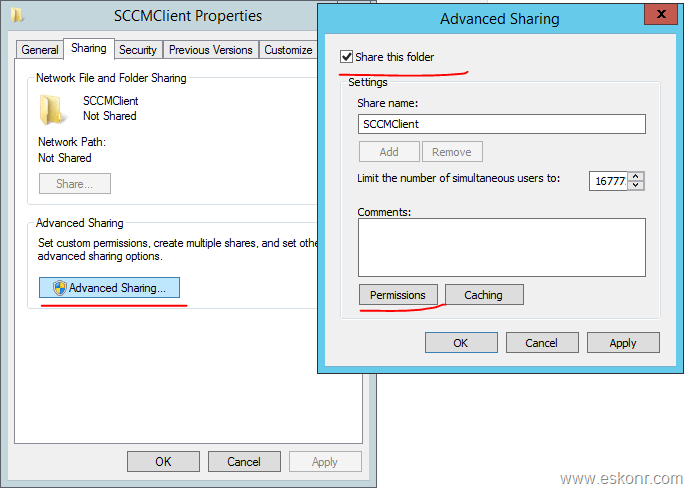 3.Create folder called hotfix in SCCMClient folder to place the hotfixes if at all any. (If you do not have any hotfixes to install ,you can simply ignore this step) .This step is needed to install the hotfixes along with SCCM client . If you are running on configmgr R2 SP1 CU3, then you need copy CU3 hotfix files into it. 4. Since am running on SCCM 2012 R2 SP1 CU3 (KB3135680) ,go to your hotfix folder (D:\Program Files\Microsoft Configuration Manager\hotfix\KB3135680\Client) ,identify the correct KB (latest cumulative update) ,client folder, copy the folder into hotfix folder. 5. Now we need to share this folder so that ,it can be accessed during the client install at system boot up time. Note the share folder path which is need to input into the control file (xml) later. 6. Now ,we will create another folder inside the SCCMClient to store the error logs for the client that fail for some reason so we can investigate at later times. 7. With this ,we have finished with folder creation and copied all necessary files . Now lets edit the start up script file and move onto group policy creation. Go to the downloaded script folder ,edit ConfigMgrStartup.xml using notepad and make necessary changes as said in the PDF document . 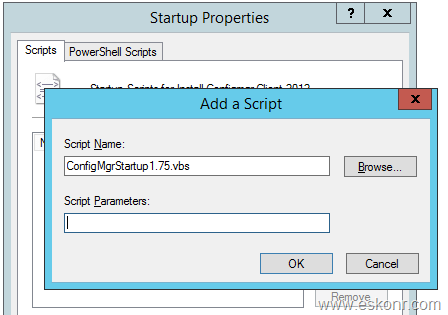 This xml file is used supply the input parameters need for vbscript during the client installation. You are required to make couple of changes as listed below (mandatory). ClientLocation—Client installation folder what we created above initiate ccmsetup from specified. AutoHotfix –if you have any hotfix to install ,will added to the ccmsetup.exe command line else ,you can ignore this . For all the location paths, I would recommend to use FQDN instead of hostname. 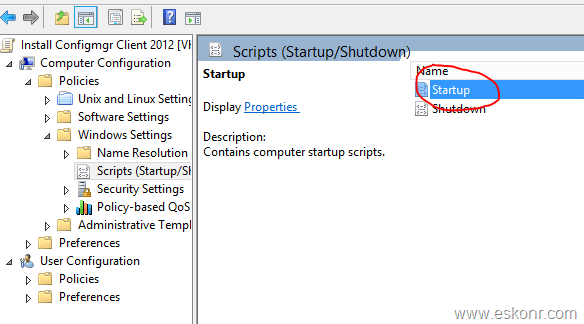 we are now ready to implement the client start up script using Group policy. 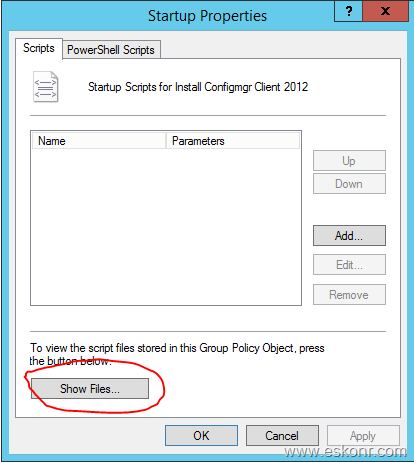 if you are not authorized/permission issues to create group policy ,take the below scripts and handover to Active Directory guy to create start up script for you. If you have issues with access denied when trying to place the files, you may have to open the actual folder (C:\windows etc) on your domain controller to place the files. Click ok and close the Group Policy Management Editor . we are now ready to link the GPO to any OU that you want the computers receive Configmgr client during the system boot up. For troubleshooting ,script will create log file with name Scriptfilename.log (ConfigMgrStartup1.75.vbs.log) in C:\windows\temp folder and for some reason ,the client did not install ,it will copy the log file to errorlog location with computer name as log file. 8 Responses to "SCCM Configmgr How to implement Jason Sandys Client Startup Script to achieve good client success rate"
Hello Eswar, I have amended the xml file as my environment but not working. no, you dont need to change anything .Did you look at the logs on the client ccmsetup.log? This GPO script is startup and it doesnt need user admin rights to install unless the account that you configured in xml file is not member of local admin. Did you configure the account that used to member of local admin on all computers as said in article. Hi Eswar, thank you for your post, the script has made it possible for us to migrate from one sccm site to another. However, have you experienced the script not running on computers that connect wirelessly to the network? Just wondering if you have seen this issue before or have heard of any one else experiencing this as well? if you want to migrate your clients from one site to other, you can use this script with enough changes to the xml file . 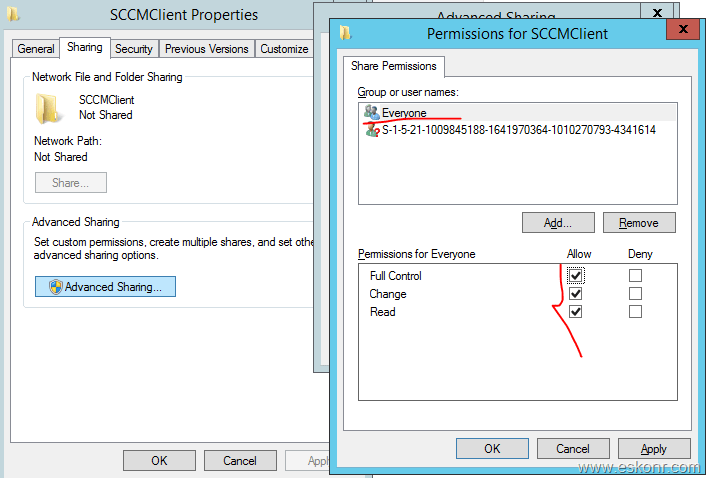 Script simply perform the installation of sccm client by verify certain things before it runs. So when computer start up ,script verify the installed client version and if that matches ,assume that client is installed ,check the client health status etc. So if you want to migrate clients from one site to other,you can definitely use this script but make sure you have configured the boundaries ,boundary groups correctly on the new site .This will help clients to pick the right distribution point to download the client installation files and assign the client to new site. Does this work in 1710 or 1802? This script works on all environments like SCCM 2007,sccm 2012 and SCCM current branch and all older builds as well.